As more evidence mounts about the state-sanctioned practice of organ harvesting in China, the public is calling for light to be shed. Doctors Against Forced Organ Harvesting (DAFOH), an organization dedicated to raising awareness about the phenomenon, recently announced that in the past year, it has garnered 245,000 signatures from people around the world calling on the United Nations High Commissioner for Human Rights to help end the practice in China, where adherents of the Falun Gong spiritual practice are the primary victims of organ harvesting. The petition was launched more than five years ago. It has since gathered more than 2.7 million signatures from more than 50 countries and five continents, according to DAFOH’s executive director, Dr. Torsten Trey. From Oct. 1 of last year, the largest number of signatures collected came from Europe, at more than 151,000, including the United Kingdom, Ukraine, France, Germany, Sweden, Spain, Romania, and more. More than 32,000 signatures were gathered in Latin America, while the United States garnered 6,079 signatures. 2,320 Australians signed the petition as well. Online, more than 22,000 people submitted their name to the petition. Trey said the petition sends a strong message to the U.N. “This petition emerges like a platform to connect all the voices of concern that have been unheard for years,” he said via an email interview. 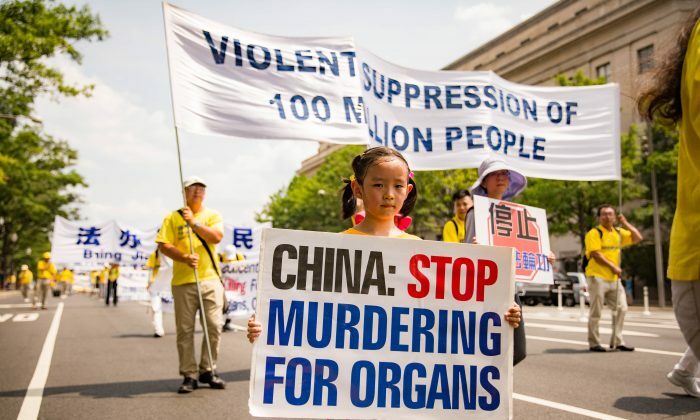 In recent years, independent research and The Epoch Times’ own reportage has revealed how the transplant industry in China skyrocketed after Jiang launched a nationwide persecution of Falun Gong, with many adherents arrested and sentenced to prison. Falun Gong, also known as Falun Dafa, is a traditional self-improvement practice based on the core principles of truthfulness, compassion, and tolerance. Its benefits to physical and mental health led to its popularity, with more than 70 million adherents in 1999, according to a state survey. Practitioners say their numbers reached more than 100 million. The Chinese regime perceived Falun Gong’s presence as a threat to its authoritarian rule and began a campaign to eradicate the practice in 1999. Since then, “millions of people who practice Falun Gong have been subject to wrongful imprisonment, ‘brainwashing’ sessions, and torture,” according to the Falun Dafa Information Center. Many Falun Gong practitioners report being given physical examinations and blood tests while in custody, a procedure that would screen them for compatibility for organ transplant surgery. According to researchers, Falun Gong practitioners are the largest source of organs. A recent report published by researchers David Matas, David Kilgour, and Ethan Gutmann estimated that China is performing 60,000 to 100,000 transplants per year. A Peabody-award-winning documentary, “Bloody Harvest,” explains that the organ removal is done while the victim’s heart is still beating, resulting in the victim dying from the subsequent loss of blood and trauma. This method allows the organ to remain in its optimum state for transplantation surgery. Governments around the world have begun raising concerns about China’s organ transplant system. In 2016, the United States House of Representatives unanimously passed Resolution 343 condemning China’s organ harvesting practices. The European Parliament also passed a declaration, calling on Europe’s political leaders to help put a stop to it. This April, Vienna’s provincial parliament became the first European capital to censure the Chinese regime for its organ harvesting crimes.